At the Holiday Inn Timonium, the Boardgame Players Association has obtained a very favorable group room rate of $99 per night plus applicable state and local taxes (currently 13%). 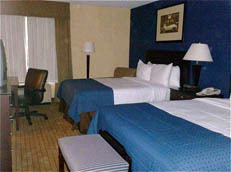 Room options include one king or two queen size beds. Chili’s restaurant is attached to the hotel and open for lunch and dinner. There is a wireless data connection in rooms and public spaces. A business center and fitness center are available. Check-in time is 3 p.m.; check-out time is 11 a.m.
To obtain the WBC rate, you must identify your affiliation with the appropriate BPA gaming conference (e.g., WAM) and make your reservation before the deadline indicated on the event page (or when our roomblock sells out, whichever occurs first) at 410-560-1000 weekdays between 8 a.m. and 7 p.m., Eastern Time. After the deadline, reservations will be accepted on a space or rate available basis. Be sure to identify your affiliation with BPA—both to get the best rate for yourself and to credit our group with your stay. For questions, contact the hotel at 410-560-1000 or 800-235-3297. Sunday and Holidays: 11:00 a.m. - 7:00 p.m. There is direct access from BWI Light Rail station. Get off at the Timonium station stop. Upon exiting the station walk and turn right down Deereco Road (towards Padonia Road). The Holiday Inn is about 1/2 mile ahead on the left. From North and South Via interstate I-83: Take I-83 to Exit #17- Padonia Road. Go East on Padonia Road towards Timonium. Turn right onto Padonia Road off the Exit Ramp and stay in the Right Lane. Make a Right at the first traffic light. This is Deereco Road. The Holiday Inn is the first entrance on the right. There is a large parking lot in back of the Hotel, if the front lot is full. Additional parking is available at next two buildings past the hotel, if the hotel lot is full. Holiday Inn Timonium is located at 9615 Deereco Rd., Timonium, MD 21093, which is at Interstate 83 and 695 (the Baltimore Beltway). There is easy access to the Baltimore Inner Harbor and its many attractions, including Oriole Park at Camden Yards and Ravens Stadium. Last updated 1/11/10 by kae.